Animals live their lives in three dimensions. By incorporating data from the third, vertical dimension - elevation, altitude, or depth - scientists can finally have a more accurate understanding of how animals move. Flatland: A Romance of Many Dimensions was an 1884 parable written to satirize the hierarchies of Victorian culture, but it also provides a fascinating, intuitive understanding of what happens when you move from a 2D world to a 3D one. Most studies of the way that animals move around their habitats have limited themselves to a 2D description, relegating the critters to locations found along the North-South and East-West axes. But for species that fly, dive, climb, or burrow, that third up-and-down dimension is pretty critical. Animals don't live in Flatland, after all. GPS loggers, an increasingly invaluable component in the wildlife biologist's toolkit, collect data from all three axes - X, Y, and Z - along with time. The problem is, most visualization software strips out that Z component, compressing rich volumetric data onto a flat sheet. Imagine wearing your 3D goggles at a movie, but watching through only one eye. What a waste! USGS biologist Jeff Tracey and colleagues have created new modeling and visualization procedures to account for that third dimension. Here, see a visualization of the 3D space usage of a California condor breeding pair for each day over nearly five years. The bottom panes show the movements of the male and female individually. The top left combines the two into a single visualization, and the top right shows the motion trajectories for the pair. To read more about this research, check out my latest column in Conservation Magazine, or read the open-access paper in PLoS ONE. 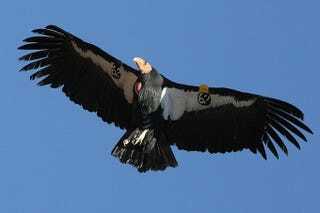 Header image: California condor, public domain.